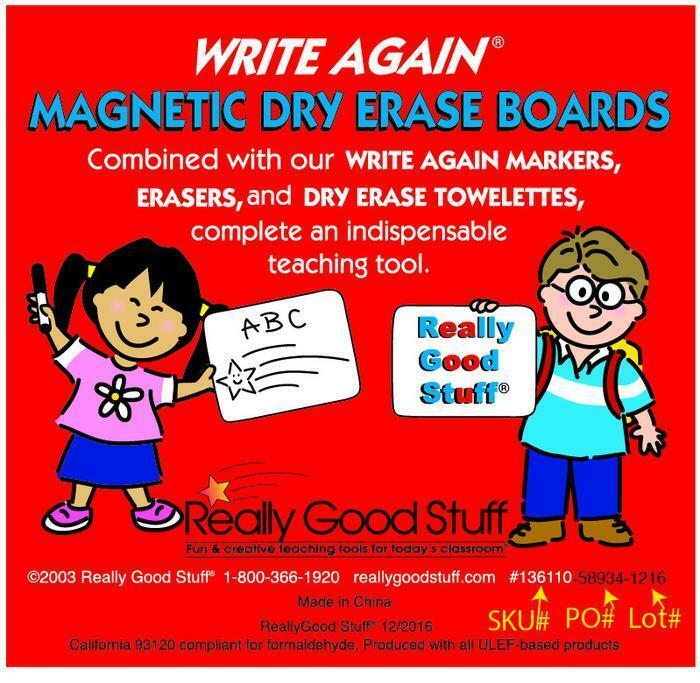 Really Good Stuff of Monroe, Conn., is recalling about 1.6 million Write Again magnetic dry erase white boards. The thin magnetic metal surface can separate from the product’s wooden board, posing a laceration hazard. The company has received 40 reports of minor cuts. This recall includes Write Again brand dry erase white boards sold in four sizes with SKU numbers: 152277 (double sided, 9 by 12 inches ); 136110 (9 by 12 inches); 152211 (12 by 18 inches) and 301800 (6 by 9 inches). Lot numbers XXXXXX-0903 through XXXXXX-1115 and SKU numbers are printed on a label on the back of the dry erase board. The boards were sold individually and in packs of six. Consumers may contact Really Good Stuff at 800-801-4046 from 9 a.m. to 5 p.m. (ET) Monday through Friday, by email at Recalls@reallygoodstuff.com, or online at www.reallygoodstuff.com and click on “Product Safety” at the bottom of the page for more information.